In computer graphics, too much is not enough. I first said that in 1980 I think, and its been true ever since. That’s why I’m such a pixel pig, sitting here writing this with 50 megapixels spread across three 31-inch monitors in front of me (4K-8K-4K), and I’d take more if I could get it (and an AIB to drive it). When I finish my toils for the day, giving advice and wisdom to our clients, knocking out incredibly well written and interesting little essays like this, I unwind by playing computer games — all for research you understand. One enduring game, now three years old, is Fallout 4 (which will be upgraded to the prequal Fallout 76 this fall). FO4 is a huge open world, multi-quest, modable, and scalable game that I think could possibly be played forever, kinda like Fortnight. 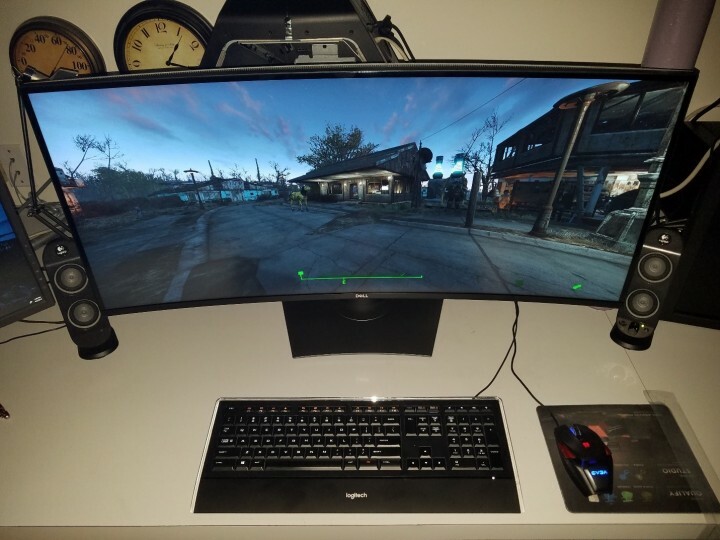 As such FO4 can take and make good use of as much resolution and field of view as you can give it. I had been playing it on a Dell 4K HDR monitor and it was stunning. But Dell took the monitor away from me, and no amount of crying, threatening, or stubbornness (gee, I can’t seem to find it . . .) helped — it’s gone. But Dell does have a heart and after months of begging has loaned us a 37.5-inch UltraSharp U3818DW to us to evaluate. It was love at first sight — and what a sight it is. The WQHD+ screen is 6.14 Mpixels, 3840 × 1600 (111 PPI) at 60 Hz, with 350 cd/m2 (nits) brightness, a 1000:1 contrast, and capable of displaying 1.07 billion colors — 10-bits per primary. Although the monitor has the color range (10-bits) it doesn’t hit the 1000 nit requirement to be qualified as HDR, but only a trained eye would see the difference. The color gamuts are 99% sRGB, 99% Rec 709, and 78.1% DCI-P3 and the sRGB calibration accuracy is Delta E. This display is gorgeous. The LED backlit IPS panel (from LG) with an anti-glare 3H hard coating can respond in 5 ms which will satisfy any gamer’s needs or ambitions. The monitor comes with two, HDMI 2.0 ports, and one DisplayPort 1.2 so no daisy chaining. There are also four USB ports. The monitor has a USB3.0 Hi-Speed Hub (2 USB upstream port and 4 USB downstream, with 2 x BC1.2 charging capability at 2A (max)). USB Type-C (Alternate mode with DP1.2, Power Delivery, and USB2.0) so it could even be used as a docking station. 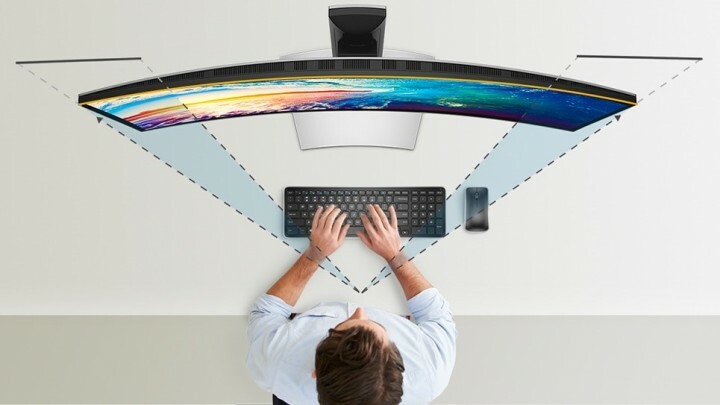 The ultra-wide is only 35.2-inches wide with 10 mm bezels and will easily fit on most desks. It can be raised up to 115 mm, and tilt forward 5-degrees, and backward 21-degrees, but obviously not rotated. However, it can be swiveled ±30-degrees. The U3818DW has two, 9W speakers and they are selected automatically (by windows and Dell driver) unless you plug external speakers into the analog or optical ports on your computer. There is also a 3.5 mm audio out socket, however, headphone usage is not supported for the audio line out connector. The color quality, brightness, and resolution would sell the monitor, but 37.5-inches compared to a 34-ich monitor really makes a difference, look at the following chart. Behind the monitor is our Alienware Area 51 R4 with a i9-7900x and an EVGA GTX1080. The 1080 is for FO4, the monitor could be easily driven by integrated graphics, or as a secondary monitor off a notebook. This monitor is not specifically being offered as a gaming monitor, Dell positions it more for a commercial audience, however, given its large curved and high-res surface, it makes a great gaming monitor. The UltraSharp is also seeing quite an uptake in the individual consumer space because of its great Resolution and Color. OK, you want one. Dell lists the ultra-wide monitor at $1,170 (which is reduced from its introductory price of $1,500), and you can find them for as low as $800 at B&H. That’s a hellofa lot of monitor for not too much money; it works out to one, one-hundredth of a penny per pixel, or 200 café lattes, and I guarantee you’ll get more pleasure out the monitor than two-hundred cups of coffee. And now, back to the wasteland.